Ran some cat 6 in the house so far so good. 4.900My new goto cable brand! Good product exactly as described very prompt delivery.. I ran this cable in a 1920 house with great difficulty. I would recommend hiring an electrician to run the cables for you. Its expensive but worth it when you do not have to repair the holes in the walls and ceilings from missing when you drill . I terminated all of the connections and tested each line. Works great. I purchased this cable to wire our all the rooms in our new house. The quality of the cable is as good as I've come to expect from . The pull box held up fine and the length markers were very helpful. In the end I'm happy to have a gigabit network in my 100 year old house. I have gone through a few boxes of cable before. No issues with the cable. Solid. No snags while pulling. Performs great. Only trouble has been the cardboard boxes not holding up well at the handles with the weight of the cable inside as you pick up the box by the handle and move it about as needed. Good product. Worked for what it was intended. Quality cable at a good price. I ran about 750 feet of this for an 8 camera security system. It is rugged and had no breaks in the entire run. gigabit connections. thats the point. worked for me. Great product as usual. This is the second order of cat 6 cable from this company and I am very satisfied. Have now completed 2 300+ ft runs for an IP security camera system and the cable has worked flawlessly. Punching down and crimping ends went smoothly. Just a great cable. 5.000FANTASTIC Value For The Price! So I have a 100/10 connection into my home. I was running 5e cabling because I only had 50/5 until this past February so no need to go all out on CAT6 cables and ports. When we upgraded the internet package I decided to upgrade the network with 20 Shaxon CAT6 110 keystones a 24-port CAT6 patch panel Intellinet 24-Port 1U 24-port switch Linksys SE3024 and a higher end router Linksys WRT-1900. What I had before was all CAT5e ports and intellinet cabling going to four 8 port switches that lead to a Netgear R6300v2. I host a server for our blu-ray / DVD digital downloads and as a file server for our laptops and desktops to have a stable back up environment. It worked flawlessly but sometimes could get congested if someone was watching a stream from the server Netflix Hulu and a backup was taking place. We have 4 active users in the house so congestion was to be expected. When I put in the new cabling and equipment the congestion was gone. I started by just using the cable to replace critical lines Switches to router and that dramatically increased the speed as well as reduced collision and congestion. The cable was easy to work with the plastic separator was easy to remove when terminating. it was flexable enough to flatten and make a quick snip. The wires were easily scored when punched down but strong enough not to get cut when removing the outer sheath. The SNR is superb and I haven't noticed any EMI issues either. You can't get anything better at such a price! I highly recommend this cable to anyone who wants to run office lines or add ports to their home. 4.400I bought this based on reviews to run through the walls and ceilings to wire the house and it worked great. This is the first time I had to buy and terminate cable since I was fresh out of college over 10 years ago. I got to say a lot has changed. I bought this based on reviews to run through the walls and ceilings to wire the house and it worked great. Using it to run several access points and POE devices. This cable is amazing. They must of re-engineered something because it is way better than the previous versions.!!!!! Works great twister pairs doe not break as easily as previous versions. Anyway way to go! buying more of these !!!! Great value packaging is easy to pull cable from. GREAT DEAL! Tough well designed Cat6 cable! Awesome cable. Wired my whole house and so far no issues. This is very high quality cable that is a cinch to punch down. I used this to run some wiring in my home and it has worked perfectly! I feel as if my home is future-proofed with this cabling. Its Cat 6 cable what more can you ask for no issues with it. 4.400Everything arrived on time, professional packaging and works great. Seamless purchase. Nothing new from the title as I am just a consumer not a pro. Everything arrived on time professional packaging and works great. Seamless purchase. No issues whatsoever. Installed in-wall from second floor to basement and to a few other rooms in my house. Gigabit through out. 4.500Well constructed cable, free from defects. Well constructed cable free from defects. Replacing the Cat 5 cable in my house has allowed the gigabit network to live up to its full potential. Used 300+ feet to wire several rooms in my house. The cable fed well and was easy to terminate. Highly recommended. good quality great speed. was not the easiest ti pull but is very hearty and can take some tugging. I was pulling through 3/4 conduit multiple runs with coax and multiple bends. the box spooled very easily. I am very happy. Prompt shipping. Great quality and price. If you are yet to buy the crimper and connectors check out Platinum Tools. met all standards required for job was contracted to do. I got this the more expensive cable because I didn't want to re-wire my office - again. My computer network required 1 gigabit connectivity which the cat 5 cable I purchased three years ago was supposed to support but didn't. So this fit the bill came quicker than expected and my office is up to spec. 5.000Very solid high quality cable. Very solid high quality cable. 23AWG instead of the 24AWG means it's a little thicker than the usual CAT5e or even many brands of CAT6. This isn't a negative thing in fact it's a positive in many ways and I was ready for it but just make sure everything you have is compatible. Most CAT6 rated RJ45s and punch downs should be ready for it regardless. The cable did NOT tangle and pulled out very smooth which can not be said for all of the bulk boxes I've used so that's a great plus. This is my second box of this cable. I used one already with 100ft+ runs without any issues. The cable is very sturdy and has a great connection if terminated well. One thing to be warned is that the cable is very thick and you have to be patient while terminated it because it is hard to get the uncut part of the cable into the connector. This is mainly because of the insulator between twisted pairs and not something specific to this product. 4.600Good quality and not too stiff. I have used this to make several cables that I run in the basement under first floor of house. No defects noticed. As easy to work with as Cat 5. The plastic divider in the middle is thin and flexible so it does not get in the way when terminating ends. I have used it successfully with the typical rj-45 ends as well as those ends where you can pull the wires though the end of the rj45 connection and then cut them flush. Ive bought Cat 6 before. I like the consistancy of this brand. Works great in residential and commercial applications. I will be ordering more. First off the box arrived just amazingly quickly. The next day even though I'd selected the free shipping. Results may vary but it's worth noting that they apparently get it out the door right away. Regarding installing the wire in the house it seems good quality cables have a good feel sheathing is good. It is coiled very well in the box and I've not encountered any snags or other difficulty with pulling the wire. Note: I'm still in the process of installing thus haven't had chance to do much testing against its performance. Will try to remember to update my review when I've had the chance to do so. Edit: I've got this installed to 10 jacks all of which negotiate to 1 Gbps. Also made two patch cables and they also work well. Excellent quality cable. This cable is working out perfect and I highly recommend for quality and value. Perfect price and perfect materials. Comes out of the box very easy. This cable installed very well in my house. I never had a single problem with any of the wires breaking I am 'very novice' at adding the connectors and the plenums were easy to cut back. Very happy. Thick solid cable great solid lines perfect when doing my house runs. Would use this for business runs as well. The quality of this cable is very good. I used this cable to run a home network in my house and I'm very impressed with the quality. It pulls well strips well and terminates nicely on the ends. If I need more Cat6 Cable this is the brand I will be buying. Bought some bulk cable from Home Depot recently for a short run from my office to living room and wanted to do the rest of my house so I searched for bulk cable. Found this cable at what I felt was a good price with good reviews so I got 1000'. So far so good! This cable has plastic running down he center I'm assuming to make it easier to run through walls I don't know that much about it to be honest and the jacket seems higher quality than the bulk Home Depot stuff. Only tiny complaint is getting the ends on with the plastic running through the cable takes a little more effort but not a big deal. Over all I can still get the job done so it isn't a big deal. I'd buy another one if I needed more. Easy to pull easy to cut easy to terminate. Quite impressed with this product considering its country of origin. Will buy again. I haven't spent the time or energy to test the performance of the wire but it appears to be performing as expected. I stream HD content through the drops serviced by this cable with no perceived degradation or stuttering. I pulled 3 separate 2-cable runs through the rafters in my attic space. Runs ranged from 50 ft to 125 ft. Had no problem at all with the spooling or even kinking in the cables. I live in AZ so the heat in the attic will be intense easily > 130 F so we'll see how well the cable holds up. I needed quite a bit of custom length CAT6 cable and this is the way to do it. The cables are high quality at a fraction of the cost of buying inidividual 1GB cables. Putting ends on the lengths can be tricky but it is a skill that anyone can acquire. I wish this came in 500 ft or even 250 ft for those who are not wiring up an entire office. I recently completed a wired home network project. This was the first time I have ever run networking cable and I found this cabling to be very easy to work with. I ordered a box of 1000ft of Cat6 wire and it arrived in two days. The wire is better than I expected it to be. It has a divider in the middle which helps to keep the wires from touching inside of the insulation. I was such a great deal that I ended up going back and buying 3 more boxes of cable. Having more than one really makes a difference especially when wiring up an entire building! 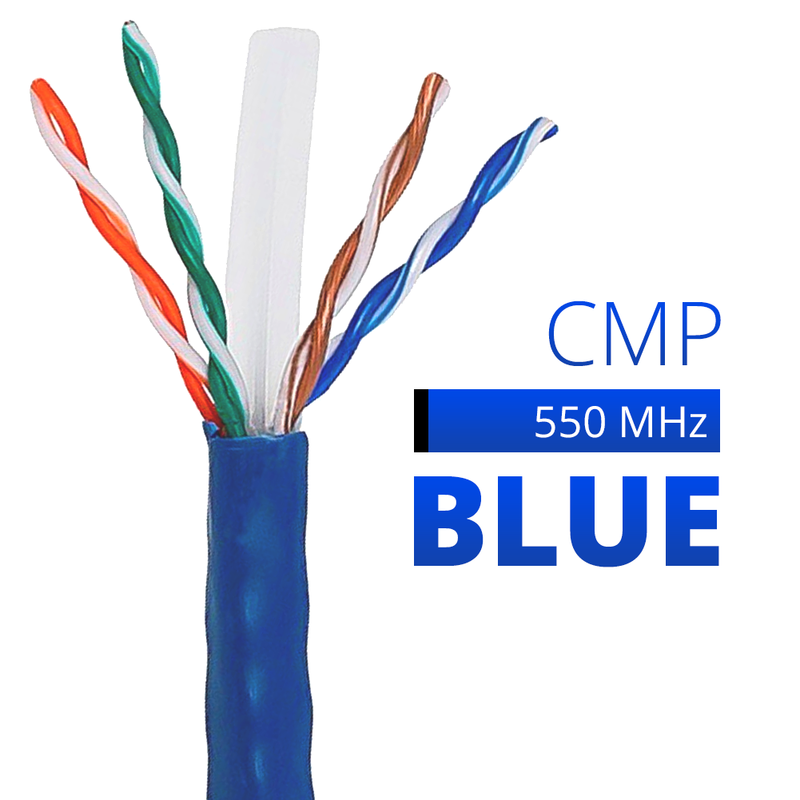 We have purchased many different cases of CAT6 cable and this is a good quality cable at a low cost. Quality product and fast shipping we have installed most all of the product and have had no problem as of now. Thank You. 4.300Works really well. Good neutral color. I am really happy with this choice for our cables at work. Cat6 is a bit more work than working with Cat5. Not a ton just a couple of extra steps and an all-around thicker cable. I might recommend making sure that your choice of RJ45 pieces work well with thicker Cat6 cords. I bought some that said they were for Cat6 but I'm not sure if this is necessary or not. Worked well for me though. Haven't compared to other makes of Cat6 cable but I was still happy with the feel and build quality of this product. Working well for us at work so far. Cost seemed to be the lowest here on for this bundle package that I found. Shipping times were about average and the reel pulled somewhat smoothly until about the last 100 feet or so. I wired my entire house on my first go around and felt I made the correct choice in buying this wire through . I received this product very quickly after ordering. It shipped the day I ordered it. It arrived intact and was just what I needed. I found it to be high quality cable. I did some serious pulling on it and did not damage it. I would definitely recommend this product! I borght 5 boxes of these cable for my company. I love it. The cable is perfect. If want me to say the the bad part it is the outside box is a little bit soft. it will borken sometime. I utilized this item in recabling a college computer lab with 36 machines. The cable was easy to use and of acceptable quality. I am very happy with my purchase. Tested some of the cable. seems to do the job. First time making my own patch cables. Very easy to work with this cable. It took me a few times to actually get one finished. Not the cables fault though kept cutting to far down with my cutters. Works very well in my home network. Cable hasn't jammed coming out fo the box and I've used about 120ft so far. I purchased 1000' of cat6 networking cable. It was my first time wiring cat6. Received it on time and as described. I wish i had bought better connectors because that was the majority of my networking frustration. First experience with a pleasant surprise. I ordered 1000' of Cat6 the price was great and the cable was a joy to work withso much so I ordered a second box. Love the 550MHz and color options the delivery was speedy and well packaged damage free. My new cable guy! This cable is easy to run and terminate. I was very impressed with this Cat6 product. The 1000ft Blue Cat6 UTP Cable Solid shipped in a separate box. The cable box makes it easy to pull cable runs. No tangling no hard to pull reels. The cable just pulled very nicely and never had a problem. I still have some left in the box so it stores very nicely. I would definitely recommend this product and buy more! Great Cable! Great quality. Full cooper wire. Bought some cheaper one from ebay to discover that it was Cooper Clad Aluminum not full cooper. Returned and bought this one from which is UL certified and much better quality. I used it for my internet network also for CCTV cameras. It has a plastic insertion to separate the 4 twists inside. Easy to work with and fast shipping. Recommended. I purchased 3000' of Cat6 cable. The transaction went very well I received the cable promptly...everything was properly shipped and arrived with no damage. Installation of the cable was inwall and my installer thought the cable was fantastic and was to spec. I was very pleased with my order from and I would recommend them as a source. The CAT6 cable came as promised even a few days earlier than I expected. I have already used about 200 feet and have found it easy to pull as well as attach the end pieces.